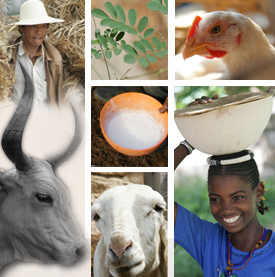 Legumes have many benefits for smallholder farmers in the mixed crop livestock systems that dominate Africa and Asia. They are widely grown by farmers but often not to their potential. This is partly because advisory services and projects promote legumes in a piecemeal way without a holistic view of farmer needs and the various benefits legumes offer. The Legume CHOICE tool is a systematic approach which lists the various legume options available to farmers and prioritizes them for particular communities. The Legume CHOICE tool consists of a list of legume options including grain legumes, forage legumes and multi-purpose trees. Each option is scored for its contribution to various farm functions (e.g. food, feed, soil fertility) as well as its requirements for resources such as labour, land and inputs. Download the Legume CHOICE tool. Development of the tool is a collaborative effort – the tool arose from a German Government funded project of the same name, led by the International Institute for Tropical Agriculture. Tool development was led by ILRI. We welcome feedback on use of the tool. Contact a.duncan@cgiar.org. Download a user guide: Duncan, A.J. et al. 2016. Legume CHOICE – a participatory tool to fit multi-purpose legumes to appropriate niches in mixed crop-livestock farming systems. Nairobi, Kenya: ILRI. Read a related poster: Temesgen, T., Duncan, A.J., Birhanu, T. and Thorne, P. 2016. Understanding niches for multi-purpose-legume intensification in smallholder farming systems: Early applications of the decision-support Legume CHOICE tool in Ethiopia. Poster. Addis Ababa, Ethiopia: ILRI. Tags: legumechoice. Bookmark the permalink.